At busy times like the yurt building, I tend to knit more than I sew. Knitting is just more portable, easy to do while you’re having a conversation. And it’s more relaxing than sewing. And you can do it while watching something, which always makes me feel less lazy then just watching something. I want to share my knitting plans with you and ask you for your opinion on a finished project. I’m thinking of frogging it but maybe it can still be saved! First up is my new hat. I used the Dreiecke pattern by Very Shannon, purchased on via Kollabora. I wanted some texture but no cables and I love geo patterns so this was exactly what I was looking for. The wool is a 50% merino, 50% yak from Peace & Wool. It’s soft to the touch and also kind of spungy. I have no idea what adverbs to use when it comes to describing yarn, haha. I chose it because I was intrigued by the yak part (matches the yurt life, don’t you think). Jo used the same yarn for her hat. It started out grey but after some use it now has a brown fuzziness. Would that be the yak, maybe? Jo has some better words to describe it, I recommend reading them. I recommend reading all her words actually, she’s hilarious. My big project of the moment is a cabled sweater. I have this second hand men’s sweater that I wear all the time but it’s starting to fall apart. I want to replace it before it’s completely unwearable. I’ve been looking for good online yarn shops but everything that’s not mass produced and has a nice colour range is just way over my budget. Peace & Wool gave all the Paris Meetup peeps a generous 40% discount code though, so I took advantage of that and ordered this tweed. My old sweater has cables, it’s a dark heather grey and because it’s a normal fit on a man, it’s oversized on me. So that’s what I’m looking for in the pattern for my new sweater as well. Some texture, some length and a loose fit. Hyerhandmade’s Polar Night Jumper is a good contestant, I downloaded it together with the Adams sweater. And I donated in return, these patterns are awesome! I also have Burda Knitting F/W 2014 (FR, NL) magazine that has some good ones in it. If you can find this issue I recommend checking it out, it has some awesome designs in it. Carmen picked exactly the ones I want to make! 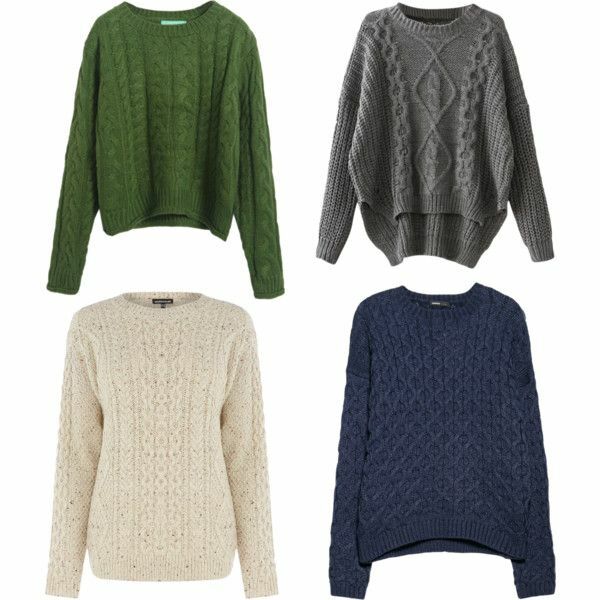 That crazy coloured vest is definitely on my list, but I went with the oversized mens sweater. I matched the gauge and the instructions for a slightly high-low hem, and made up a cable pattern to go with it. The front is done and the cables worked surprisingly well. At least, if I had payed more attention. I had to go back several times. I’m halfway the back now and it’s going smoothly. The cables are enough to keep me interested so it looks like I will actually finish it. I’ve actually already knitted a cardigan this fall. I bought the wool when we were in Groningen in August, Lana Grossa Lei Color in two grey colorways. I used the Perth Cardigan pattern by Goodnight Day, also via Kollabora. I lengthened the bodice and the sleeves but I’m not sure I should have. I’ve already frogged it once completely because it didn’t close at the front and the neckline was too wide. Now that I look at the pattern again it looks like its not even supposed to close. I finished it but then it was still too snug around the hips so I shortened it. What I like about it is the subtle colour blocking, light grey on top and dark at the bottom. What I don’t like is that it looks so heavy. I feel slouchy in it. The neckline stretches a lot because of the weight, I had to pull it together with a thread at the top. I also feel it could use more texture. I’m thinking about frogging it completely and doing a raglan (like the Kingston sweater) with a moss stitch for the bodice and stocking stitch sleeves. I still want long sleeves though, I don’t see the point of a really warm sweater with 3/4 sleeves. So I don’t know. Is it the sleeves? The stitch? Should it be a sweater? If you have any ideas please leave a comment! What’s on your needles this winter? Will you finish before spring? The grey gradient for your Cardi is beautiful. Personally I would turn it into a pullover. Cardi’s are wonderful if you spend time in centrally heated buildings, and need to adjust your clothing a lot. I find that sweaters are just more practical now that I spend more time outdoors. Yes that’s it I think: my sweaters are either on or off, indoors I really don’t need them and outdoors I want it as warm as possible. Thanks!